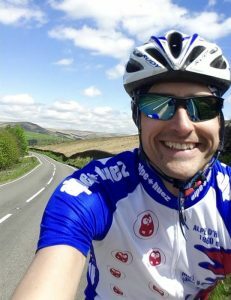 This month’s rider interview comes from Jonathan Veitch Consultant Anaesthetist at Nottingham University Hospitals NHS Trust. Jon formed part of two teams of cyclists from the trust who took part in our Derby Arena challenge earlier this year to raise money for Nottingham Children’s Hospital, The Big Appeal. I saw the event advertised on the Nottingham University Hospitals intranet, they had another team entered and were looking for more. This was all in aid of the Hospitals Charity. Three of our team had completed the Coast to Coast in a Day, last year. We all enjoy cycling and individually have completed many endurance events. This was something quite different as it was warm, dry and there weren’t any hills! I made a lot of sandwiches….. Other than that, just our usual training really. It’s rather hard to train for 30 minute efforts spread out over 24 hours, so I think we just made it up as we went along. The whole day is a bit of a blur, but one moment that did stand out was near the end of my penultimate stint on the track. Realising that we’d broken our target, were probably going to break 500 miles and that I only had another 30 minutes to pedal, were all a bit emotional. The final few hours were really tough. We only had four riders from 10pm the night before, this had meant some back-to-back sessions in order to try and get some sleep. I think it’s difficult to describe the feeling of climbing on to the bike that tired, knowing that you have a team behind you and we didn’t want to let anyone down. Even with that tiredness, I think we all got a bit of a rush when you join a pace line and push yourself to maintain track speeds. What would your advice be for someone thinking about doing the challenge for the first time? This is a tough challenge and one that should be respected. We were all surprised how fast we were going but the effort was pretty intense and seemingly never ending. We were all confident riders and that really makes a difference, we could enjoy track riding to its fullest. Therefore, my advice is get to the track, it makes you a better rider and is really the only way to prepare for an event like this. 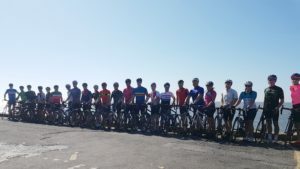 Between them, Team Anaesthesia and Radiology Rollers raised over £3000 for Nottingham Children’s Hospital and we hear rumours both teams will be heading back again to take on the challenge in 2019! We look forward to welcoming Jon and the team back next year!